I've been tricked! Voyage to the Planet of Prehistoric Women is basically the same movie as Voyage to the Prehistoric Planet but with some added scenes of Venusian women swimming and sitting on rocks. A bunch of astronauts go to Venus to look for some other astronauts. Along the way they run into lizard monsters and a plant monster, but their robot, John, helps them out when he can. Until the robot complains about having to carry their worthless hides across the lava river and then they disable his circuits. 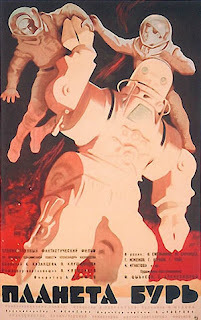 Later on, the guy that made the robot feels bad about it but not for long because this other guy won't shut up about this noise they keep hearing and he is positive that it is a beautiful Venusian woman. One of the other guys brings up the more likely scenario that it is a space monster, but nothing will kill this guy's fantasy! These are the most carefree astronauts ever. When they are not droning on and on endlessly about imaginary space babes, they are laughing off killer plant attacks, or dressing up in alien costumes to scare each other. "While swimming I encounted something." "But it was just a harmless octopus." 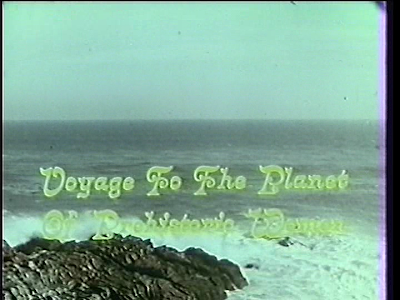 The only purpose this movie serves, other than providing the hilarious voice overs, is to make you realize that Voyage to the Prehistoric Planet in hindsight is not so bad. And that is my review, of both movies. HAHAHA aw that poor sea monster, what a shame. What is life about for him now? Nothing. astronaut jones could have sorted out the "Voyage to the Planet of Prehistoric Women"
The sea monster really looked pretty sad, I felt bad for the little guy. He would have!! These guys were roughly around his level in terms of astronaut skill, but I think if they met the Venus women they probably would have ended up dead.